In the busy school day of a teacher many feel their schedules don’t allow for the complexities of the equipment and set up necessary for podcasting. But it needn’t be that way. Even the busiest of teachers can get started quickly and easily wit h just their cell phone. Because of its ease and simplicity, phone casting has become a popular resource in the bag of tricks used by teachers such as Josh Stumpenhorst, Meg Wilson, Lydia Leimbach, and Paul Bogush. They know using the tools students love is a sure fire way to engage 21st century learners. Phone casting provides the ability to easily create and capture an audio broadcast from your phone that can be published and shared. While the services are ever changing a Google search will provide ideas for a number of free options. 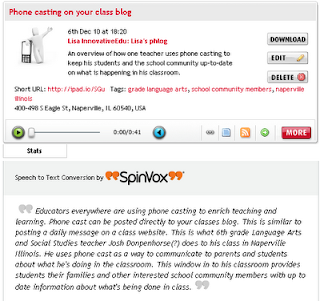 Currently iPadio, Voki, and Phonecasting.com are popular options for recording audio from a phone. When you hang up, Wah La! You’ve created a phone cast that can be broadcast to the world. What’s more, many of these services are beginning to allow you to listen to a phone cast from your phone as well. The following is a collection of ideas these educators have implemented to successfully engage learners with phone casting. 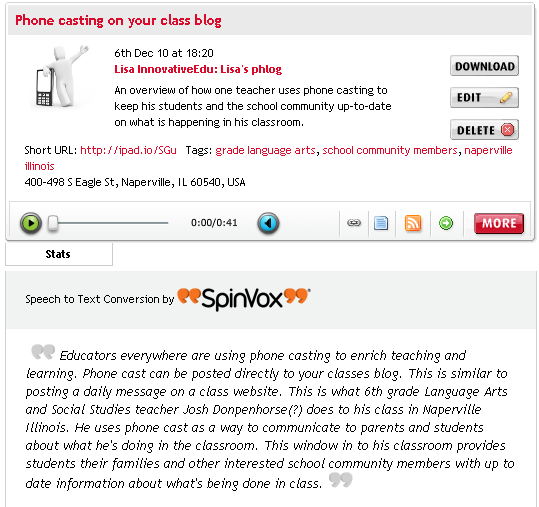 Phone casts can be posted directly to your class blog. This is similar to posting a daily message on a class website. This is what 6th grade language arts and social studies teacher Josh Stumpenhorst does for his class in Naperville, IL. He uses phone casts as a way to communicate to parents and students about what he is doing in his classroom. This window into his classroom provides students, their families, and other interested school community members with up to date information about what is being done in class. Here's what a phone cast looks like. Wearing a basic headset that comes with every cell phone, teachers can record unit mini lessons with iPadio. This is a great way for students who were absent to catch up on what the class is doing, for students who need a lesson review, as well as for parents who are wondering, “What did my child learn in school today.” Teachers could even record several mini lessons in advance of a unit and let students flow through at their own pace. When High School Technology Integrator Lydia Leimbach can’t be at her school in Farmingdale, Maine, Voki is in. She creates Vokis to let students know what they need to do in class. In the assignments section of her class web page, she simply creates a Voki for each subject area that day letting students know what they’re expected to do with further directions embedded right on the page. Not only does this help the sub, it also gets them energized to get to work. 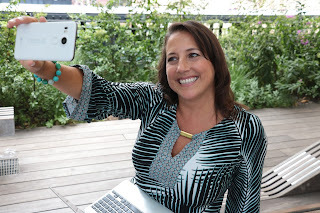 Use phone casting in teacher professional development. Following professional development sessions, participants often complete a survey that only the instructor sees. Instead, turn this into a learning and promotional opportunity for your class. At the end of class, using your telephone as a microphone ask participants to share one thing they are excited about learning and how they plan to incorporate it into their practice. As the phone caster, the facilitator will want to have a catch intro and conclusion, end the call, and a phone cast is made. This can be posted on the facilitator’s online space with the course materials for others to listen to. Educators who have students with special needs know that in some cases students have accommodations for some of their students such as extended time, or having parts of the test read to them. In the past this has caused somewhat of a disruption either requiring the student to be removed from the class and a school staff member removed from their regular responsibilities to read to them, or in some cases the teacher and student sit in the back of the class as the teacher tries to read quietly to the student as the rest of the class hears this going on. Not only is this disruptive to the teacher’s schedule, it can also be embarrassing to the the students. In Meg Wilson’s class podcasting has changed the game. Staff is no longer required to be removed from their duties, and students are no longer singled out. Meg reads the student passage and creates a podcast for the student. During the test any student with this accommodation is given unobtrusive ear buds and a mobile device to listen to the passage. In today’s digital age, testing companies should be required to provide such accommodations, but until then, we have teachers like Meg. In Paul Bogush’s 8th grade social studies class, world leaders are not just names of unknown stuffy old people in a book. Paul started a group with his students called, “Lunchtime Leaders” where students interview leaders from around the world on their opinions about what students should do to be prepared for the future. It started in the fall of 2008 where he and his students decided to interview all the candidates that were running for Mayor in their city. When they were done they decided to keep the project going and found more people to interview. They are called the Lunch Time Leaders because they actually interview all of the leaders during their lunch period which means that we have to start and finish within twenty minutes. While three years into the project, Paul and his students do most of their interviews using Skype and fancy equipment, students can start their own project easily using phone casting. The simplicity of phone casting is traded with a reduction in quality, which is generally fine for teachers and students new to this work. You can listen to their podcasts at http://lunchtimeleaders.podbean.com. Create an “our school” podcast. Let students create a weekly podcast featuring their school. This not only helps build the home-school connection, it also provides students with the opportunity to showcase great things that are happening at the school. Podcasts could include student of the week, teacher of the week, project of the week, event of the week...you get the picture. What a great way to not only celebrate the school community and build school pride, but also highlight the people, events, and projects that rarely are featured. If the school has a newspaper, this can serve as a great companion. Students love video/audio but we don’t always want to show their faces for safety reasons. Voki allows kids to create a quick voice podcast with an avatar. It’s great when the task requires a concise message and the use of cell phone increases engagement. Lydia Leimbach used Voki as part of a cyberbullying project. After a quick Poll Everywhere survey she found if given the choice, students preferred hearing or watching information on this topic so Lydia used Voki to get their message out. Because it’s limited in time they had to be concise and make sure each sentence was information laden. From there the Voki’s could be both embedded on the class cyber bullying page as well as the student’s own web page. Have students create a “What we learned in this unit” phone cast as you conclude a unit of study. Teachers may want to work with students to create a template to follow and share for “What we learned. This might include things like: “unit overview,” “things everyone should know about…” “what I still want to know.” This is a great way to get student perspective on the learning and a great project for interested students. Have struggling writers create phonecasts with iPadio by telling their story right into a cell phone. Not only will they be able to hear their story back, but iPadio does voice to text conversion. Simply remind the student to speak loud and clear and then dial iPadio and your special personal ID number. After the student records their story, iPadio does the rest converting their spoken words into written ones. From there the story can be copied/pasted into a word processing document for final revisions and editing. How to get started with these tools. Go to ipadio.com and sign up for a free account. Once you get an account you will get a “secret” pin that you can use when calling into the 1-800 number. Once you call in and enter your pin you can record a message that will post instantly to you ipadio account. This is live and can be listened to right on the ipadio sight. You can have your “phlogs” as they call them, post directly to most blogs. Register at www.Voki.com with your email and password. Select the look, clothing and accessories. Add your voice by calling the number Voki provides, or have Voki call your number by entering it. Choose a background from the Voki library or upload your own. For additional ideas, resources, and workshops outlining additional ways to use cell phones for learning, including research-based strategies, lessons, and more, check out Teaching Generation Text. Josh Stumpenhorst - Josh is a 6th grade Language Arts and Social Science teacher at Lincoln Junior High School in Naperville, IL. He enjoys using a variety of digital media to enhance his curriculum and engage his students. Specifically, he uses a lot of digital storytelling and movie making to bring his curriculum alive for his students. You can follow his work at www.stumpteacher.blogspot.com as well as on Twitter @stumpteacher. Megan Wilson - Megan is a Special Educator and Adaptive Technology Specialist in a secondary school in Connecticut. She is a mobile learning advocate who has a passion for educating others on the importance of individualizing instruction for all students. You can follow her work at http://www.ipodsibilities.com as well as on Twitter @iPodsibilities. Just updated my Voki and added to my blog thanks to you. Also played with iPadio. Fun and super easy! Linked it to my library Facebook page and Twitter. Can't wait to use with my students. Marvelous post. Will experiment with iPadio this weekend. 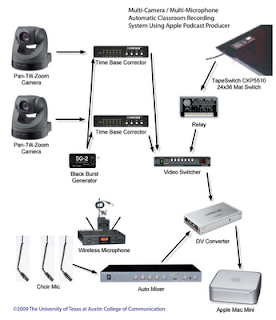 Add to the list of phonecasting tools/sites: AudioPal, Yodio, Cinchcast, UHaveAudio. I think educators should also review many of the voice recording/publishing apps that are available for mobile phones including AudioBoo, Dragon Dictation, and iTalk, among others. The apps provide a simple solution for capturing and publishing audio as well.